S tyle #B7503. Size L/34. Not an easy belt to take pictures of. But it is beautiful. Size Large 34. IF you have any problems or concerns once you receive. New black BRIGHTON pebbled leather belt stamped size 2X. It has silver toned hardware and is a hook closure. Overall length end to end is 42 1/2" and width is 2". In middle hole belt wearing length would be 41.5". Very good condition with wear from normal use but many years of wear left. Brighton Vintage Large Concho Western Tan Leather Belt 1993 S 47307 . Condition is Pre-owned. Shipped with USPS Priority Mail. Buckle 1 1/2" height X 2 1/2" length. Belt width 1 1/4" Total length 38" end to end. Excellent condition. One side of the belt is brown moc croc leather; reverse is smooth black leather. Gorgeous silvertone Brighton buckle. Brighton Vintage Leather Black Brown Link Mesh Reversible Belt Womens 38" . Condition is Pre-owned,with no damage and very minimal wear. Condition: In goodpre -owned condition, leather shows wear, but not cracked. Brighton Leather belt. Holes at 32" - 36". total length 40". Women's Brighton Stainless Steel Black Leather Fashion Western Belt Sz L 34 39"
We proudly support the Fisher House Foundation, Helping Military Families. You’ll get what you need right here for a great price! CONDITION:Nice belt with little wear. NICE item! 100% authentic! Brighton Red Skinny Belt Size XL 36 Silver Buckle And Heart Charm . Condition is Pre-owned. Shipped with USPS First Class Package. Some wear on silver metal, see photos. Style 40209. Hefty silver plates connecting one another with braided design detail. Brighton ?. Condition is Pre-owned. Marked “1996” on the back of the silver buckle. 37.5” from buckle to last hole. If you wear a 36" pant you would normally need a 38" belt. Belt sizing is normally from the end of the belt without the buckle to the center hole of the tail (most belts have 5 holes). Ladies Belts are normally sized S/M/L. Gorgeous silver buckle and details. total length including buckle: 33 1/2. Size Small 28. Style B10174. Brighton Disney belt size small 26. STYLE~Black reptile textured with silver tone hardware. AUTHENTIC Vintage BRIGHTON Women's DESIGNER Black Belt w Silver Buckle 30-34. Condition is Pre-owned. Shipped with USPS First Class Package. Beautiful Brighton Womens Silver Braided Design Black Leather Belt SZ M/L 32 BL2503. Holes @ 30-34" 36.5" total Length Condition is very goid Pre-owned. Shipped with USPS First Class Package. Thanks for looking! Brighton Leather/Metal Heart Belt - Medium. Condition is Pre-owned. Shipped with USPS First Class Package. Minimum belted length is 30". Maximum belted length is 34". These measurements are based on the first link and the last usable link on the dangling chain. Reversible at the buckle and/or at the silver-tone accents that divide the belt into 3 sections. Able to flip sides/colors so belt is all black, all red or a combination of black and red. Silver-tone buckle and accents adorn the belt to add style and grace. Pre-owned 1996 Brighton Equestrian Design Leather Belt. This item is used. Has wear, tarnish, hanging tread and scuffs. Size on belt says 34. Item # B-6. Brighton Black Leather Wrap Belt Sz L Double Loop Buckle Style B30993 GUC! Style B30993 -GUC! Condition is Pre-owned. 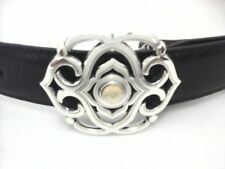 Brighton Black Leather Wrap Belt Sz L.
Brighton Black Leather Zoo Belt Silver Animal Conchos NWT MED 30. Condition is New with tags. Shipped with USPS First Class Package. Brighton beaded leather belt. Silver buckle. Black leather with pink, purple, aqua beads. Size 34 or Large. Vintage Brighton Brown Leather Silver Scroll Buckle Women's Belt Sz 31"-35"
36" long x 3/4" wide. Women’s Leather Belt M 30” . I believe it is Brighton, but the belt is not marked Brighton, It is adjustable several ways.Solid red, Solid Black, and red and black. Swivel Reversible Red Black. Condition is Pre-owned. Shipped with USPS Priority Mail. 38 1/2 long not including buckle. Great heavyweight belt, made in the USA. Embossed crocodile leather. I did clean this with silver polish and it did tarnish, so I’m not sure if it’s silverplated, or sterling silver. BRIGHTON LEATHER BELT. A CASE WILL OPEN IF ITEM IS NOT PAID FOR. Concho: 3" x 2.75". Buckle to Tip: 38.5". Buckle to First Hole: 30.5". Buckle to Last Hole: 34.5". Belt (Top - Bottom (minus buckle)) - 39". Buckle - 3 1/2" x 2 1/4". In charming great preowned condition. Brighton Leather Belt Brass Buckle Blue Women's Size M #40514 1" Wide . Condition is Pre-owned. Shipped with USPS First Class Package.